Congratulations to our winner who was selected at random by Google Sheets! You will be contacted shortly about receiving your prize. You will have 3 business days to respond to the contact email or your prize may be awarded to someone else. Our next giveaway is another reading book of a different type. 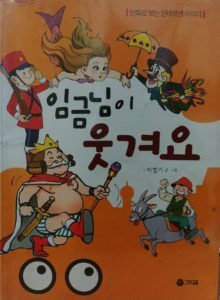 This book is a Korean comic book (만화책) that was written and illustrated by Lee Bum-Gi (이범기). It contains numerous well-known fairy tales. And what better way to practice your Korean reading abilities than with a comic book of stories you are already familiar with? Some small amount of book information can be found on Google books and on Aladdin books. But I’ll give you a rundown of what’s in the book below. A number of these stories look quite familiar and that’s a good thing! I’ve noticed for myself that whenever I’m reading in Korean, it’s so much more helpful to read a story that I’m already familiar with because I can pick up so much more through contextual clues and my knowledge of how the story goes. Plus, with illustrations and onomatopoeia for sound effects, the story really comes to life in a childlike manner – which can be a really fun way to practice Korean reading. 이범기’s profile can be found on Kyobo Books. 한국문인협회, 어린이문화진흥회 회원이며 한국만화가협회 이사를 지냈다. 초등학교, 중학교, 고등학교 교과서 삽화를 비롯하여 ‘세계 명작 동화’, ‘한국 대표 창작 동화’ 등 어린이책에 그림을 그리셨고, ‘신통방통 엽기 마술’, ‘오싹오싹 공포 마술’, ‘대제국 고구려’, ‘세계의 인물’, ‘교과서 만화’, ‘만화 삼국지’ 등의 만화책을 펴내셨다.